Also known as phenori - feni - pheni. 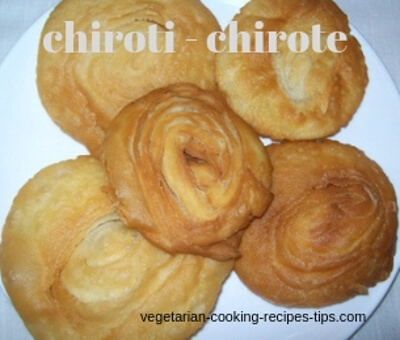 Chiroti chirote is Indian flaky pastry recipe. It is a festival food make in Karnataka and Maharashtra. It is also known as phenori or feni - pheni. In Karnataka, lighter and flakier and richer variation is made during wedding feasts too. You can see some plain chirote and some with sugar mixture sprinkled in the image above. It is a popular recipe made as a part of 'Diwali Faral'. As it is easy to make and doesn't take too long, you can make it any time you feel like eating chirote. Chiroti is easily available in sweet shops all the time. But the homemade snack items during Deepavali have special attraction. Chirote is worth making. Add sugar to your mixer/blender and run the mixer for a couple of minutes. Check if sugar is ground to fine powder. Run mixer again if necessary. Sugar should be ground fine. Mix sugar powder and cardamom powder in a small bowl. Keep it aside. Making mixture for layering, known as sathe or sathi. Take rice flour in a small bowl. Add ghee or oil to it. 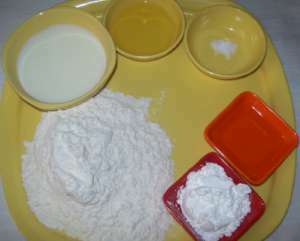 Mix rice flour into a paste. There should not be any lumps. Mix maida (plain flour), salt and ghee/ oil in a bowl. 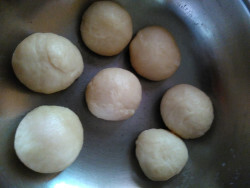 Add water little by little to make a stiff dough like poori dough. Keep the dough aside for about 1 hour. Keep it covered with a wet cloth. After one hour, knead the dough and divide the dough in 6-7 portions. Form each portion in a round ball as shown in the image. 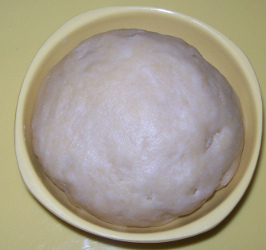 Keep dough balls covered with a wet cloth till you are ready to roll them. Roll out into very thin circles like chapati from each ball. Keep them on a plate. Once all the circles are rolled, take one chapati on a board. Apply a bit of rice flour and ghee mixture on the chapati. place another circle on the first one, keep the second chapati a little off center, it should not fully cover the first chapati. Apply rice flour mix to the second chapati too. Repeat the procedure to stack up all the circles. Starting at one end, roll the chapathis into a tight roll without applying too much pressure. Using a knife, cut the roll into about 2" pieces. Keep all the pieces under a wet (wringed out) cloth. Take one piece at a time and, roll it into small circle using a belan(rolling pin). Roll lightly from center to the side, from all sides. All the layers should be clearly visible. You need to be careful while doing this. If you press too much, you will not be able to see the layers after frying. Heat ghee or oil in a pan. Reduce heat to minimum. Put 5-6 chiroti in the hot oil. How many you put at a time will depend on the size of your pan and the amount of oil you have added for deep frying. Do not add too many at a time. Do not let them brown too much. Take them out from the frying pan when they are golden brown and place on a flat plate. Fry all the chiroti in batches. You can see the layers in the image below. Sprinkle sugar and cardamom mixture on the fried chiroti while they are still warm. 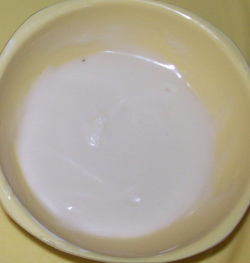 Store chirote in a dry, airtight container. These chirote are good for 2-3 weeks. 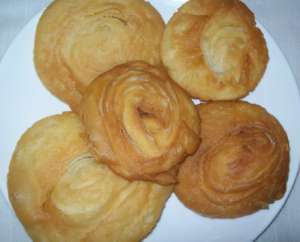 Plain chirote can be sprinkled with powdered sugar. This is more common way of serving. Plain one can also be eaten as they are without sugar. You may sprinkle a little chutney powder if you like them spicy.